With this set, you’re covered! Make cookies featuring popular holiday and theme shapes like sports, flowers, animals and more. 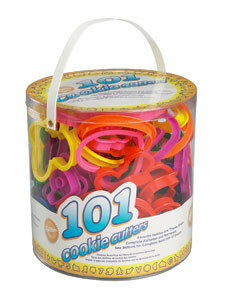 Or use the complete alphabet and numeral collections included to create the perfect cookie message. Great for cutting all kinds of food into fun shapes—perfect for crafting, too. Average cutter size approx. 3½ x 3½ in. Recipe included. Shapes includes are letters A-Z, question mark, numbers 1-8, 3 different sizes of hearts, 3 different sizes of scallopped hearts, double-heart, heart with arrow, bunny face, egg, butterly, flower, sun, tulip, cross, bunny, 2 different sizes of pumpkins, ghost, moon, scaredy cat, haunted house, witch, bat, 2 sizes each of gingerbread boy and gingerbread girl, 2 sizes of christmas tree, candy cane, snowman, stocking, bell, foot, hand, boot, cowboy hat, shooting star, flag, 3 sizes of circle, 3 sizes of star, 3 different sizes of scalloped circle, bone, dog, fish, 2 different sizes of teddy bear, duck, stegosaurus, tyrannosaurus rex, trophy cup, baseball hat, football helmet, football, train, car, plane, firetruck and dumptruck.